Fabric Width= minimum of 54" / 137cm. THERMAL BLACKOUT CURTAIN LINING FABRIC (3 Pass). BLACKOUT CURTAIN LINING. this is 3 Pass quality - A quality 54" Blackout Curtain Lining it is ideal for a multitude of furnishing projects. Fabric Width= minimum of 54" / 137cm. THERMAL BLACKOUT CURTAIN LINING FABRIC (3 Pass). this is 3 Pass quality - A quality 54" Blackout Curtain Lining it is ideal for a multitude of furnishing projects. WHITE - THERMAL BLACKOUT CURTAIN LINING this is 3 Pass quality - A quality 54" Blackout Curtain Lining it is ideal for a multitude of furnishing projects. It has asuper-soft finish that drapes perfectly unlike may blackouts. Material: Blackout FabricWidth: 46 - 59"
IVORY CREAM - THERMAL BLACKOUT CURTAIN LINING this is 3 Pass quality - A quality 54" Blackout Curtain Lining it is ideal for a multitude of furnishing projects. It has asuper-soft finish that drapes perfectly unlike may blackouts. Produced to the very highest specifications, this lining has many benefits including thermal/insulating properties, sound reduction and guarnteed light exclusions. Lining Type: Thermal Blackout. We have vast experience working within the fabric trade enabling us to help you find the best fabrics at the best prices. John Lewis. mainly cream. may have a grubby mark being roll ends. 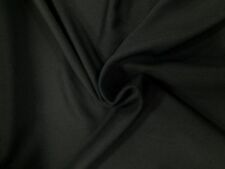 Fabulous 80% blackout fabric with excellent draping qualities. A STITCHING SERVICE IS AVAILABLE. 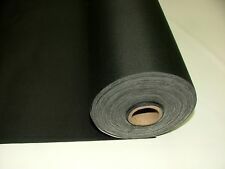 If you require your blackout material to be stitched to a particular size we can do this for you. FIRE RETARDANT BS5867 PART 2. 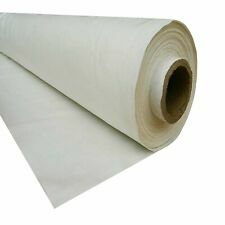 10m lengths of IVORY CREAM - THERMAL BLACKOUT CURTAIN LINING this is 3 Pass quality - A quality 54" Blackout Curtain Lining it is ideal for a multitude of furnishing projects. Fabric Code. ISLE of MAN - ISLE of WIGHT - CHANNEL ISLANDS. 54" OR 137CM (approx). 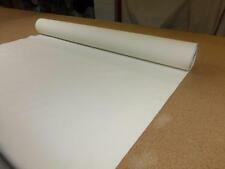 This is Top Quality Blackout Thermal Curtain Lining Fabric(3 PASS) to blackout the unwanted light. You can attach it to your existing curtains to block light instantly. THERMAL BLACKOUT CURTAIN LINING FABRIC (3 PASS). Double width fabric 116" wide (294cm). This fabric is drapewell very good rare fabric. Size : 137cm (54") wide. Crease Resistant 3 Pass Blackout Lining. 100% Blackout. A new, high quality, silk feel, crease resistant lining. Colour : Cream. Washable and dry cleanable. Free sample available on request. This is ainherent Fire Retardant fabric therefore can be washed repeatedly without the FR being affected and the price cannot be beaten. One of the better blackout fabric on the market. Matt Black on one side and light gold on other side. £3.00 per metre Colour: White/Cream Width: 137cm (54”Wide) Composition: 50% Cotton, 50% Polyester Thermal and blackout qualities (Good quality) High quality curtain lining in white and cream. The blackout properties is to keep light out making it perfect for bedrooms and the thermal qualities help to keep heat in during colder weather. 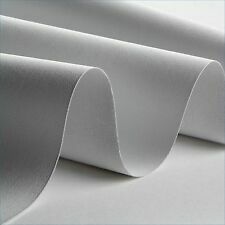 A polyester/cotton blend, it has been coated with a light acrylic foam and with a velvety smooth texture. Please note: We sell by the metre minimum buy is a metre. Please note shade variation may occur due to differences in screen resolution and manufacturer dye lots. Please feel free to call us on 07766716591- 07470 991549 thanks. Thanks for viewing! 115CM WIDE X 65CM LONG REMNANT. SALMON PINK BLACKOUT FABRIC. This fabric is like a biscuit cream tried to get right shade in pics. Double width fabric 108”. Material: Blackout FabricWidth: Less than 45"
3 pass BLACKOUT lining have the benefit of TOTAL light-blocking, as well as giving the curtains a beautiful luxurious look and insulating the window. Blackout curtains can block 40% of noise. Usage : Drapery, Blinds. 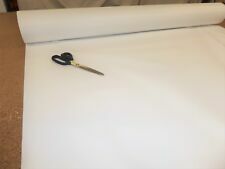 10m lengths of WHITE - THERMAL BLACKOUT CURTAIN LINING this is 3 Pass quality - A quality 54" Blackout Curtain Lining it is ideal for a multitude of furnishing projects. ISLE of MAN - ISLE of WIGHT - CHANNEL ISLANDS. Double Width blackout lining/curtain fabric heavy material can be used for all types of projects looks mainly silver grey 116”(295)cm wide very wide linen effect. Dimout fabric drape well fabric. 6.5m lengths of GREY - THERMAL BLACKOUT CURTAIN LINING this is 3 Pass quality - A quality 47" Blackout Curtain Lining it is ideal for a multitude of furnishing projects. Fabric Code. ISLE of MAN - ISLE of WIGHT - CHANNEL ISLANDS. MASSIVE REMNANT JOHN LEWIS THERMAL BLACKOUT CURTAIN LINING FABRIC. WHITE.